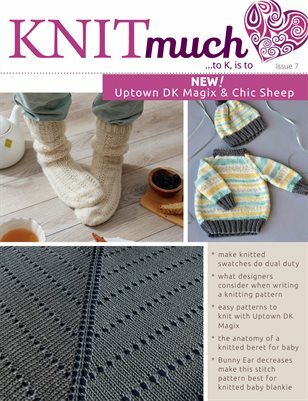 Welcome to a new issue of KNITmuch magazine! We review four yarns, two yarns created with natural fibers and two with acrylics. See how they are constructed, the fiber content, how they knit up, and suggestions for knitting projects. I'm talking about Uptown Worsted Magix, a new addition to the Uptown Worsted collection with anti-pilling properties you'll love. Dreamy yarn, an acrylic yarn perfect for those soft socks, blankets and anything you want to feel cozy in. Another new yarn, Chic Sheep by Marly Bird is 100% merino wool by Red Heart. For natural fiber lovers, this an excellent choice for winter knitting. And for those who knit their summer clothes during the winter, included is our review of Papyrus yarn, a soft linen and cotton blend that offers cool and soft knits for the whole family. Don't miss our tutorials on steam blocking, writing patterns for beginner knitters, the anatomy of a knitted beret, bunny ears decreases, and you know there's so much more.